Getting away on first passages are the hardest. There is always more to do than time allows. But at some point you have to say “Enough, we are out of here.” In our case a reasonable weather window was the incentive to get on with it. Of course “reasonable” is a relative term, especially when leaving New Zealand during the equinoctal gale season after an especially unpleasant winter. 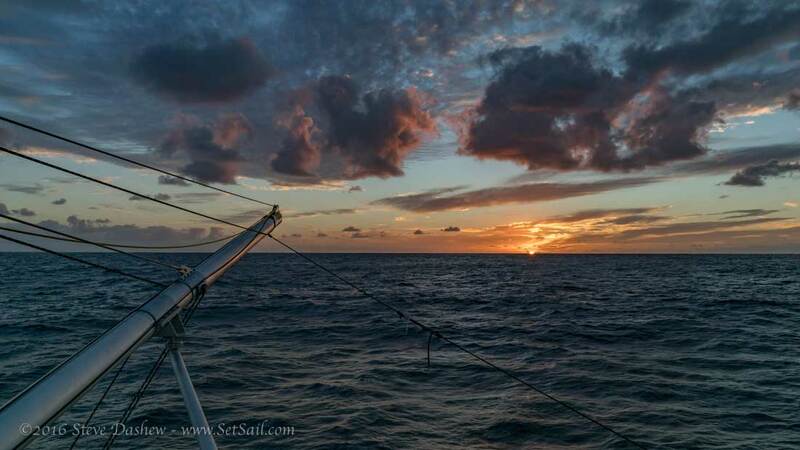 Our first sunrise at sea, after almost four years of effort, reminded us of just how much we missed cruising, and what we had given up to design and build FPB 78-1 Cochise. Booms out for reduced windage in the beam-on apparent wind, Cochise was on best behavior. 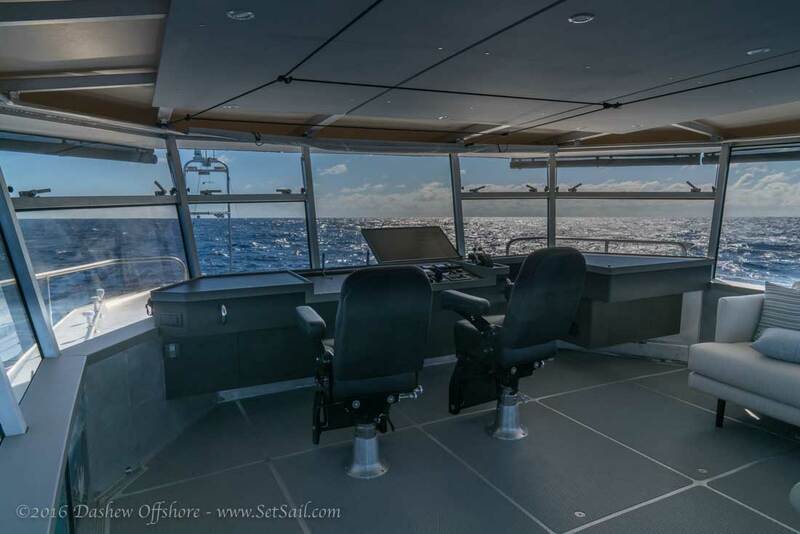 If you are going to make long passages, comfort and security at sea become paramount. Bigger yachts are often less comfortable and harder on their occupants than smaller craft. This results from the larger spaces and increased distance of living areas from pitch and roll centers. 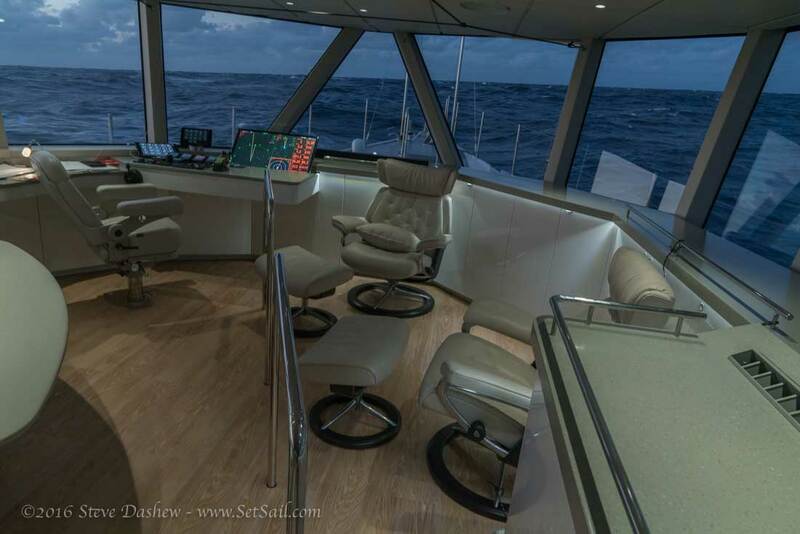 We had put significant effort in terms of hull shape, polar moments, and ergonomics on the FPB 78 design to offset potential negatives, but we knew that the open areas of the great room and Matrix deck would be more dangerous at sea than we desired. 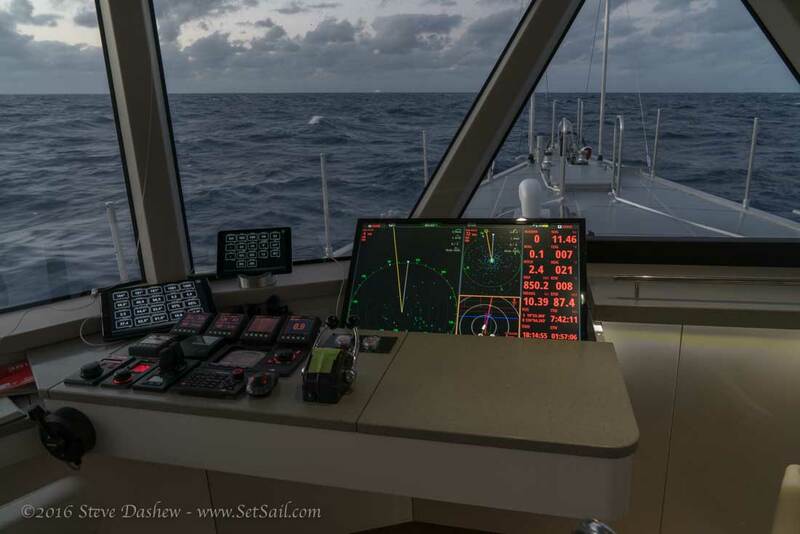 Sea trials had been positive, but only several days on passage will let you know if a given design works or not. If you look carefully near the upper left corner of the right watercolor above, you will see an eyebolt to which one of two manlines was affixed during the passage. These also exist in guest cabins, forepeak/annex area, and the workshop aft. The forepeak and workshop manlines will remain permanently. The others will come and go as required. It takes one person less than two minutes to install a set of lines in the great room or Matrix deck. 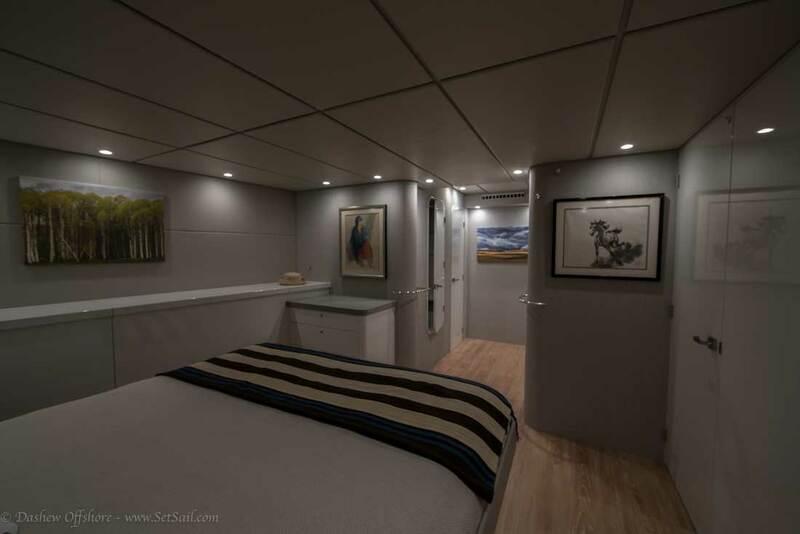 The galley is larger than in the past, with a layout that allows two people to work together if desired, while still holding you in place at sea. 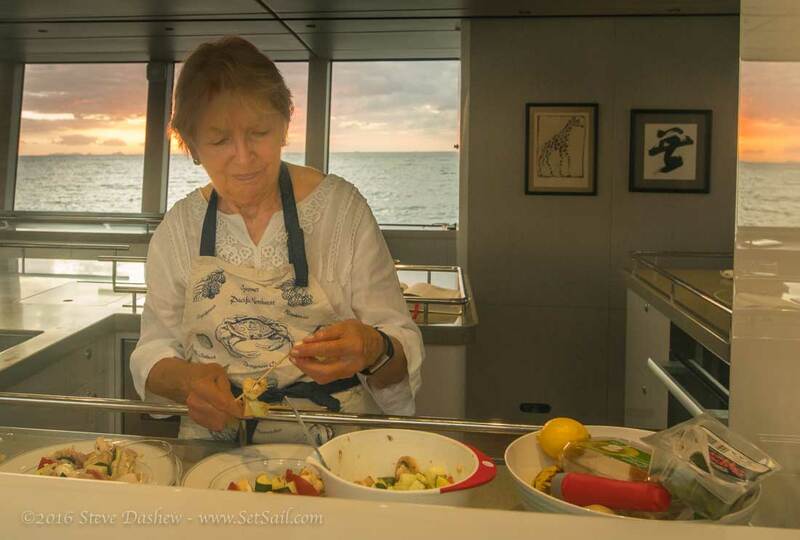 Part of what makes the larger galley work well when underway is the change from timber fiddle rails to stainless grab rails. The ability to close your hand around the rail makes it much easier to hold on when required. 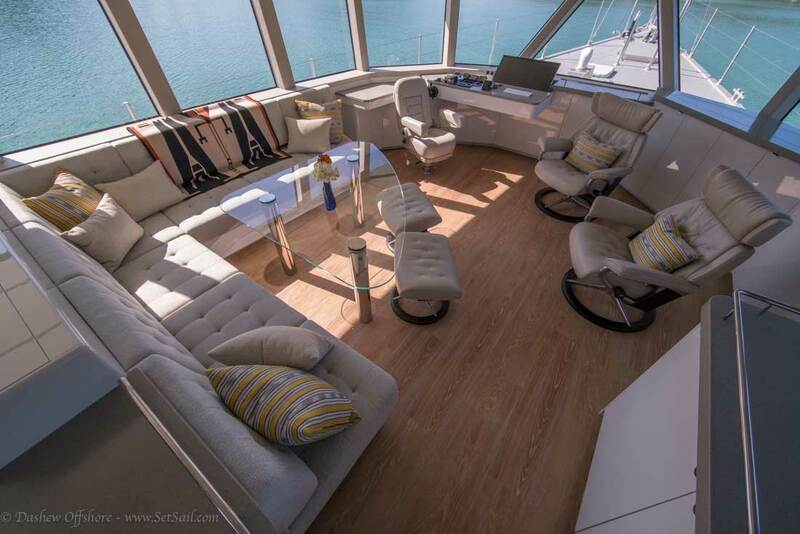 From our very personal perspective, FPB 78-1 Cochise is exceptionally comfortable, significantly more so than Wind Horse. 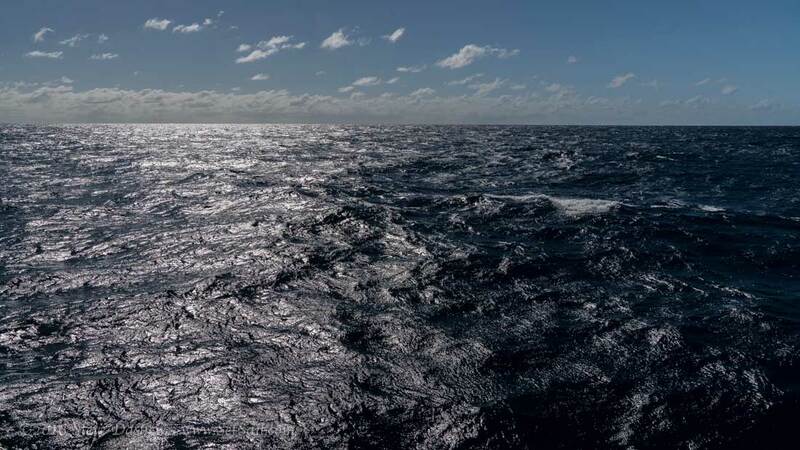 Even after 1100 nautical miles, half of which were in boisterous reaching conditions, we arrived feeling rested. The two of us have almost always made our passages as a couple. But maturity, and different family commitments, pointed towards the advantages of a permanent crew member as an option. Having additional space for this, and a layout that allowed everyone privacy, was one of the driving forces behind the FPB 78 design. When the time came to begin looking, one of the first people we thought about was Steve Parsons. 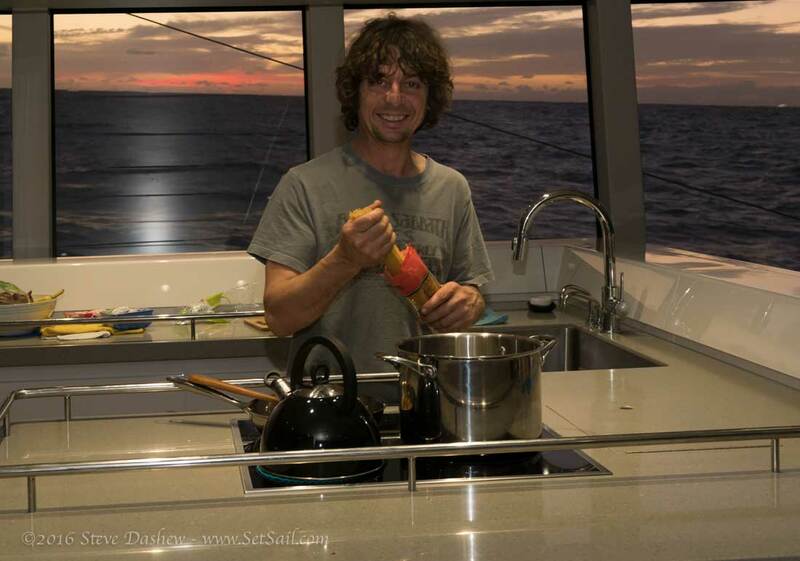 Steve has more FPB miles under his belt than anybody but ourselves, as a skipper and teacher. 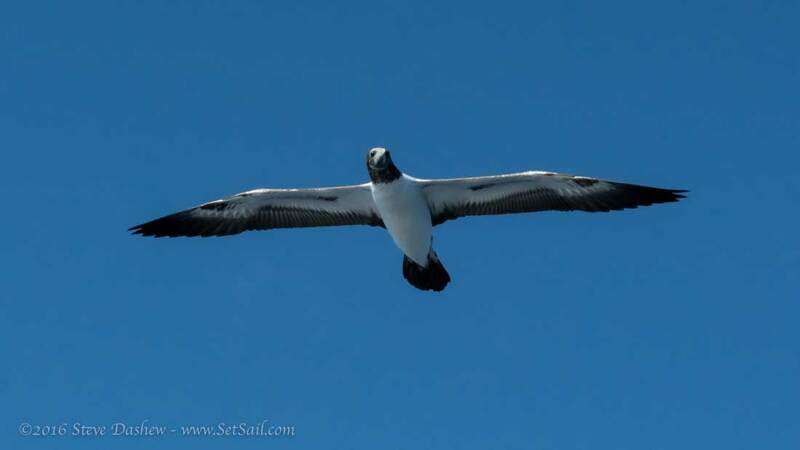 He has earned his stripes under sail, spent significant time in the Southern Ocean, and knows both experientially and at the gut level what the sea can unexpectedly dish up. When you have this resumé, your approach to all things maritime is altered for the better. When Steve became available we offered him a place aboard. Our last significant sea time was almost four years ago, so we did not fully trust our positive evaluation of Cochise’s motion. On the other hand, Steve Parsons has spent a majority of the last five years aboard FPB 64s, so his frame of reference is current. His take is that the FPB 78 is significantly more comfortable than the FPB 64 in all conditions, particularly with the beam reaching which was so much a part of this initial voyage. 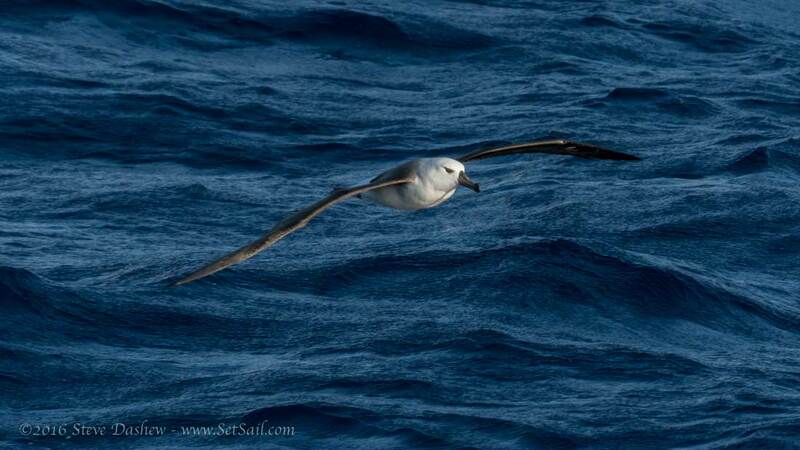 This albatross is a good indicator of motion. 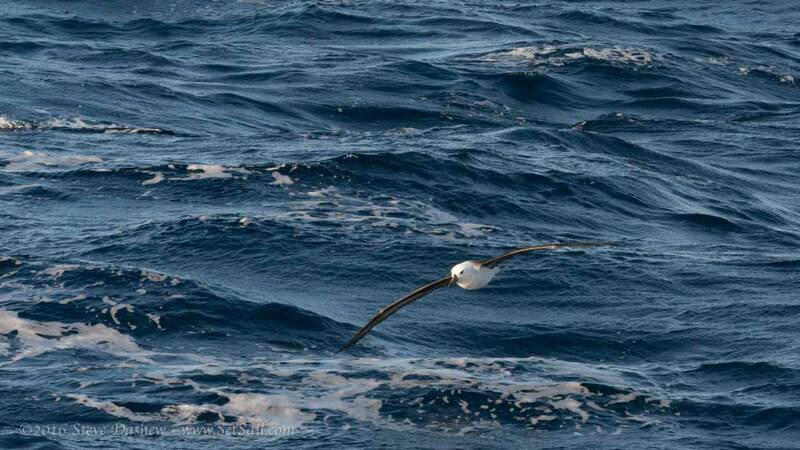 Trying to focus a telephoto lens on a low-flying albatross, as it works three meter swells, is not going to be successful unless your shooting platform is stable. Gooney birds are a little easier, but catching them full frame is almost impossible from the deck of a small yacht. Sea state is always difficult to capture in a photo. Waves on the beam (like these two to four meter swells with wind waves on top) are going to upset your equilibrium, regardless of vessel size. Cochise’s ability to maintain her poise in conditions like these does come with a cost. We have traded away a bit of fuel burn efficiency above 10.25 knots, in exchange for increased comfort. 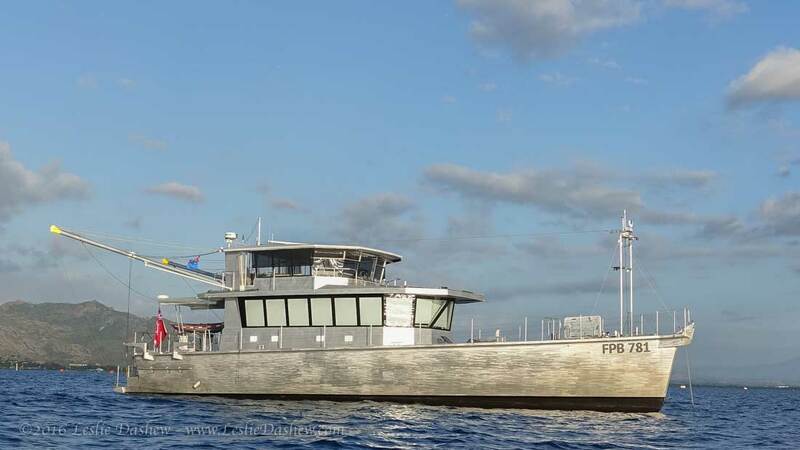 While the FPB 78 is capable of almost the same speed as the FPB 97, she is happiest at a more stately 10.5 knots, which is what she averaged to Fiji prior to slowing down for optimal arrival, just after low tide, at the pass to Lautoka. This being our maiden voyage, we spent much of the passage experimenting with different trim configurations (moving fuel and water, boat speeds, accessory load packages, etc.). The extensive N2K data system, which monitors almost all vital signs aboard, calculating variable data averages at different time periods, will allow us to fine-tune our performance in ways we couldn’t have dreamed of even a few years ago. During this initial “experimental” passage, fuel burn varied. We averaged between 6.7 US gallons an hour at just under 11 knots, running square downwind with no major auxiliary engine loads, and up to nine gallons an hour while using air conditioning, making water, and cruising at 10.5 knots in 25-30 knots of wind with 2.5-4 meter beam seas. Cochise did what she was expected to do. She cruises quietly and comfortably. Her heating and air conditioning are the best we’ve ever lived with. She is keeping two guest cabins and a large owner suite air conditioned all night long on her batteries, with a large part of the power consumed being provided by her solar array. She gives us space for guests, crew, to mingle or separate as wants and needs dictate. Designing and building yachts is a demanding endeavor, and we don’t make this any easier by pressing for an ideal outcome in all major areas, something we know is difficult to achieve. The process with the FPB 78 has been the most challenging we can remember. During the build cycle, we often questioned our decision to part with Wind Horse and spend so much time on land. 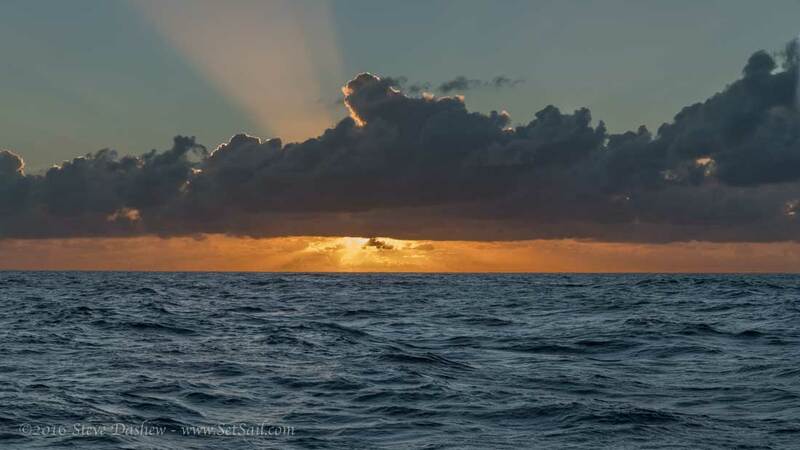 Will the cost of four years of missed cruising sunsets be worthwhile? We will eventually know the answer after the pain of birthing has passed. 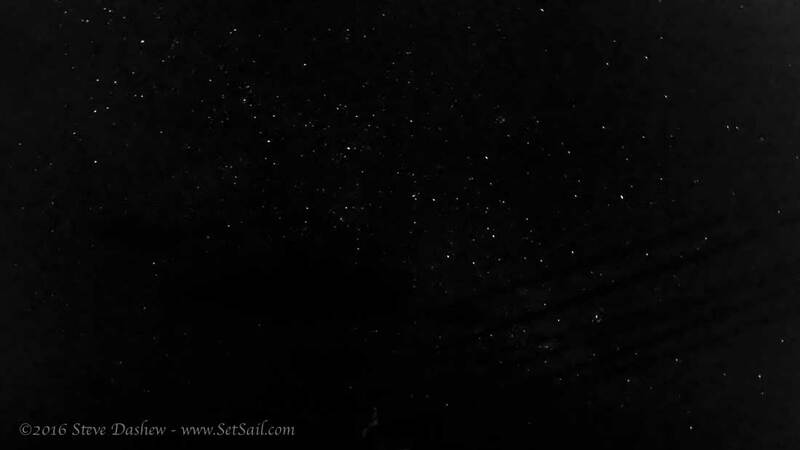 Right now, the ability to capture star field photographs from the deck of a small yacht at sea has us looking forward to more cruising on Cochise. And we are happy to be in Fiji. If you see us at anchor, stop by and say hello. This entry was posted on Thursday, September 8th, 2016 at 3:37 pm and is filed under Dashew Logs, four, FPB 78, The Logs. Both comments and pings are currently closed. 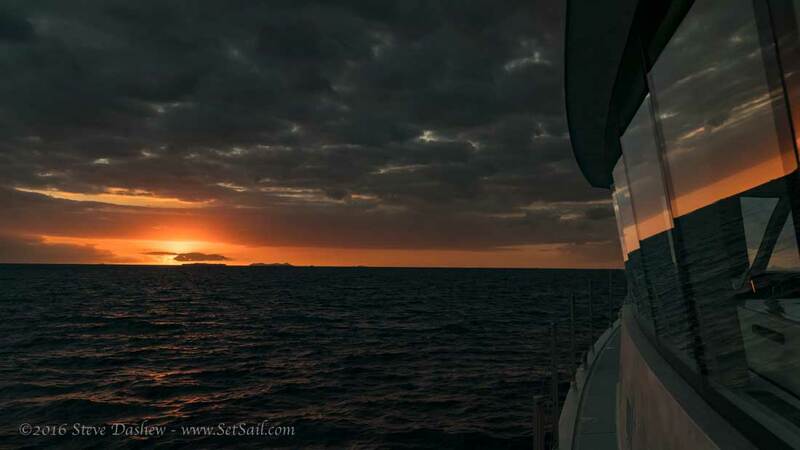 Hi Steve: Thank you for the update; it’s good to hear you’re underway again and with the usual beautiful photo’s to boot. I’m curious how much difference in underway comfort you experienced between the great room and the matrix deck? Am so happy that Cochise cruises so well, and that your expectations are being met so satisfactorily. Kudos to trusting your intuition re building her. That’s a real blessing that Steve became available — talk about “magical-timing”. Which 64(s) did Steve skipper/crew? Hi James, Steve Parsons has skippered aboard FPB Iron Lady, as well as teaching aboard other FPB 64s. Thanks, Sarah, i knew I’d seen his name mentioned on someone’s blog, and i couldn’t remember whose. i just went to Pete’s 64-3 Iron Lady blog, all the way back to 12mar2011 — while Steve was Captaining for them. That blog-post was about the Brigantine Soren Larsen being in NZ, and that Steve had served as a deckhand on it for 6-months early in his career. Thanks, again, for taking the time to assist me with that. I can easily get how much your Dad+Mom appreciate your being available to handle the blog for them — i know i do. Great post! In the last photo all of the curtains are down. Will you be having a set of the outdoor shade cloth sewn up or just stick with the interior curtains? Shade cloths are under current discussion as is window tinting. Your four year effort rewriting the art of cruising is more than words can carry. Unbeliebvable and truly great is this accomplishment. Do you have 2 sets of davits on the starboard side? In this post, the last picture shows very low davits that would swing below the lifelines. In the last picture of the “It is time” post, the posts on the davits are taller and they can swing over the top of the lifelines. Are there little pop-out pieces of flooring where the staple rails go? There’s no visible gap or hole in the flooring in the pictures of the great room without the rails in place. The starboard davits were shortened. And yes, there are plugs for the staple rail holes. Congratulations! Looking forward to hearing more updates. It must feel great being back out cruising again. Enjoy! You folks definitely deserve it. We will do a post wih details at a later date. There’s a short answer in the comments from today. Lucky encounter… We are enjoying a sunny day at anchor in Genoa Bay, Vancouver Island, BC, presently admiring one of your FPB models that dropped anchor near us this afternoon. We haven’t identified the name or model yet (US registered) but browsing your website for information allowed us to also enjoy your most recent blog entry and take virtual tours of your boats. Steve, could you explain how these “manlines” are constructed? The manlines are a spectra grid, with two lines running fore and aft and two or three at right angles. There are four snapshackles used to attach two of the lines, the others interconnect. Is the table lexan? Tempered glass? How will it perform in high seas? Thanks much for all of your comments. The table is half inch glass. So far it has done fine. Wonderful photography ….obviously a very pleasant passage. Reward for all that effort…..proud father ! Spectacular photos, thank you so much for sharing. I think many of us readers would love to see what you see. In one of the above image captions, you mention that “Booms [were] out for reduced windage in the beam-on apparent wind”. Actually, I could imagine that there also is a positive effect because the swung-out booms increase the boat’s moment of inertia in the roll axis. Or is the weight of the booms so low that it is negligible? The polar moments of the booms do indeed increase roll period. Been a follower of yours for years….we are currently cruising on an outremer 55 catamaran with our family and are at Musket Cove, having just made the passage from Suwarrow (loved the old pictures you had up on the site…we just did that exact reef walk with our kids). Love to see Cochise in the flesh! We are in Denerau, visiting friends and tied/anchored in front of their home. Be out your way by the weekend. I am considering the purchase of the Sundeer 60 “Avalon”. I believe it to be hull # 5. I am told that it has a carbon mast with running backstays but no shrouds. Do you know if this was the vessels original configuration and if not, what is your opinion as to the seaworthyness of such a rig? I have been a big fan of your boats for many years and hope you will find the time to respond. Send me a photo of the Avalon rig and I will get back to you.